Filiberto Lomeli does his best impression of Devereux Beach on a recent S.C.A.P.E. outing. 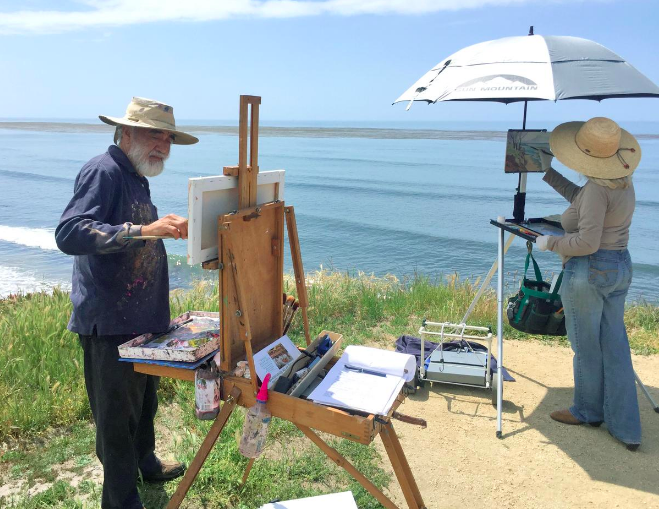 “What an exciting sense of color!” exclaims a passerby, inhaling both the powerful ocean air and the expressive work of a member of SCAPE’s monthly en plein air “paintout,”this time on the bluffs above Devereux Beach in Isla Vista. Indeed, pursuing the moody colors of light and shadow is central to the outdoor painting tradition, which was started in the mid-19th century by student artists painting the forest of Fontainebleau in rural France. However, for the artists of SCAPE —which stands for Southern California Artists Painting for the Environment —it’s not only nature as the subject but also nature as the cause. SCAPE’s primary mission is to run exhibitions that raise money to protect open spaces while increasing public awareness of environmental and conservation issues. Its more than 200 members collaborate on three plein air shows each year, which are curated by independent jurors and benefit environmental organizations. For their show at the Maritime Museum on July 25, for instance, Heal the Ocean will receive 40 percent of all proceeds; that leaves 50 percent for the artist and 10 percent to fund SCAPE’s endeavors. Each show typically focuses on an area of interest to the beneficiary, and the themes and locations of each paintout routinely change. Though there’s a sense of healthy competition with each paintout, they also foster camaraderie and education. SCAPE’s president, Carrie Givens, hopes all skill levels feel comfortable joining the paintouts without pressure to submit to the exhibition. “Maybe you will get better and feel confident about entering the show,” she said encouragingly. No matter what, spending the day contemplating the drifting sun over California’s celebrated,naturally brilliant tapestry is never wasted time. See s-c-a-p-e.org for a schedule. The next paintout is on Saturday, July 14, 9 a.m.-noon, at Devereux Slough.